While attending a potluck dinner, we placed our meal on paper plates and picked up plastic cutlery to eat with. 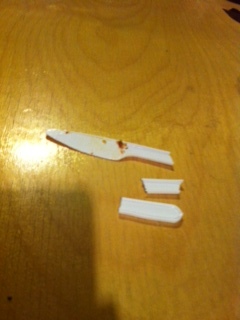 When my husband tried to cut his chicken the pressure he applied on the knife caused it to snap into 3 pieces. I looked at him and said “I think there’s a story here.” Instead of getting him a new knife, I pulled out my phone and took a picture of the broken piece of plastic cutlery! To me this knife was a reminder of what happens when too much pressure is applied in my life. I have been known to keep adding things to my to-do list until I have far too many commitments. Knowing that I can’t keep up adds so much pressure to my life that I am liable to snap. This is especially true during this time of the year. Life can be busy enough without adding extra shopping, baking, decorating and socializing to the mix. The added pressure takes away from the true meaning and joy of the Christmas Season. Christmas is not about running myself ragged. Instead of being ready to snap from too much pressure I need to stop and reflect on the true meaning of Christmas. It is the celebration of the birth of Jesus. God sending his son to earth was the greatest gift known to mankind. Nothing else can compare. The gift I can give back to God is that of my time and appreciation. It’s easy to do and fills me with peace, joy and love.